FinTech and Banks. Friends or Foes? The paper assesses the threat posed by digital banking as seen in the context of a long series of financial and technological innovations in the banking sector. 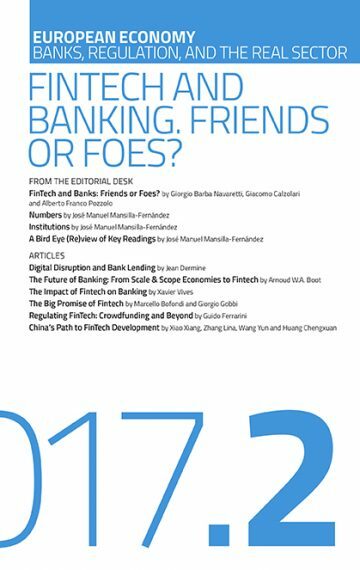 It focuses on the economics of banking services and banks’ two main functions – as providers of liquidity and loans – and analyzes whether these could be displaced by peer-to-peer and marketplace lending. The influence of fintech is beginning to be felt in the banking sector and capital markets. This article surveys its development and its impact on efficiency, banking market structure, strategies of incumbents and entrants, and financial stability. Fintech has a welfare-enhancing disruptive capability but regulation needs to adapt so that the new technology delivers the promised benefits without endangering financial stability.